Sayla was diagnosed earlier this year and is currently in treatment. 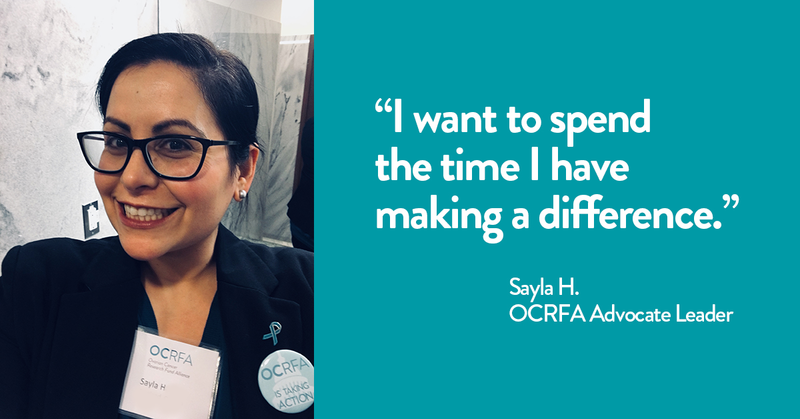 She’s determined to use her experience to help other women, and is empowered to advocate for women fighting ovarian cancer through OCRA’s Advocate Leader program. Ovarian cancer has taken a lot from me. Most painfully at this point is that it has taken my fertility. But, ovarian cancer has also given me a mission and the resolve to share my story, because if I can save just one other woman, my own experience will at least feel worthwhile. It all started when my husband and I decided we wanted to have children. We visited our fertility doctor who sent me for an exam. I’ve never had an abnormal exam or tests, so I wasn’t worried. A few days later my doctor called to tell me that my pap smear found ovarian cancer cells on my cervix. Since pap smears do not detect ovarian cancer, I would need to be seen by a gynecologist oncologist for more tests. Those tests ruled out cervical cancer, so next was a biopsy. The plan was to remove one of my fallopian tubes and one ovary to test for ovarian cancer while I was in surgery. When my gyn onc opened me up, the biopsy confirmed stage IIIC serous low-grade ovarian cancer. My ovaries had displaced my other organs (my bladder was flat as a pancake, which explained why I constantly had to pee), and the cancer had spread to both ovaries, the lining of my abdomen and was in the fluids in my abdomen. 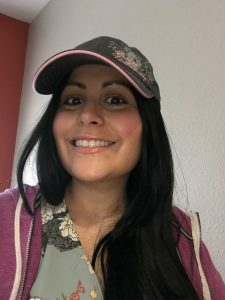 Following my doctor’s recommendation, my husband and sister made the difficult decision that my ovaries, fallopian tubes, uterus, and cervix be removed, and tumors debulked. My doctor let them know that my ovaries were doing me no good, and that no reputable fertility doctor would try to get eggs out of them. After my recovery, it was recommended that I start chemo. I learned that low-grade ovarian cancer doesn’t typically respond well to chemo, so I decided to seek out a second opinion from one of the top low-grade ovarian cancer doctors. He let me know that some patients were having luck with Letrozole, a maintenance drug. I decided to skip chemo and go straight on Letrozole. Less than six months went by before I had muscle strain pain in my abdomen and extreme fatigue. My gynecologic oncologist ordered a CA125 blood test, a CT scan, and a physical exam. All three tests confirmed a recurrence. After another surgery that involved the removal of two tumors, my appendix, and included the resection of my bowels, the pathology report confirmed the tumors were once again low-grade ovarian cancer. Currently, I am going through chemo. Most low grade patients are chemo resistant, but I hope that is not going to be the case for me! Once this round of chemo is finished, then I hope to be put on a Parp Inhibitor for maintenance. I’m also hoping that I can get into a clinical trial at some point. It is so important to know symptoms of ovarian cancer and risk factors. I had symptoms of ovarian cancer. If I had known then what I know now, I would have asked for a CT scan or a pelvic/abdominal ultrasound when I first experienced symptoms of frequent urination, fatigue, bloating, and abdominal pain. I wouldn’t have been quiet about my symptoms, nor would I have thought they were a normal part of being a woman! Even through all of this, I feel so lucky. I am blessed. I have the most amazing husband ever, my little sister lives in New York but flies in for my surgeries, and right now, my mom is here from Hawaii. I have a full life with four fur babies (two cats and two dogs, all under 15 pounds)! My friends and neighbors are caring and helpful, and as much as I want kids, at least I don’t have to worry about how my kids would take this. I recently met another newly diagnosed woman my age. I told her she’s lucky she has her daughter, but she feels guilty, because what if she doesn’t survive? What happens to her child? Since my diagnosis, my whole outlook has changed. I appreciate everything more. I tell everyone I meet… Cherish relationships. Appreciate life. When did you become an OCRA Advocate Leader? I became an OCRA Advocate Leader in January of 2018. I found out about the OCRA Advocacy Program through Facebook, and applied last fall. I got accepted in January, and I was so excited! Right before we went to Washington DC in March, I found out the cancer came back. But I was still determined to go, and my surgery was scheduled a few days after I returned. I was not aware of ovarian cancer until I had it, so I wanted to do anything and everything I could to spread awareness after I was diagnosed. Most women think they are being screened for female cancers at the gynecologist’s office, yet, there is not a pre-screening tool for ovarian cancer, and that needs to change. I was nervous, but we had a full day of training before we had our meetings which gave me great talking points and thorough instructions. It was my first time in DC, and it is a very exciting place to be, there is so much action you can observe just while walking the halls. The staffers of my reps listened to my story and my requests, and they were very receptive and compassionate. It was a great experience. I felt heard! No, but sharing my story is the most important contribution I can make. As Advocate Leaders, we have monthly group calls where we are given updates on how our efforts in DC are progressing and what we can do on our ends (reaching out to our reps, for example, about certain issues). Right now I am scheduled through the Ovarian Cancer Alliance of Oregon & Southwest Washington (an OCRA Community Partner organization) for peer mentoring training. This will help me learn how to mentor other ovarian cancer patients through their initial diagnosis or through a recurrence. Currently I am going through chemo, so fighting cancer is a full-time job, but once I am in remission again I hope to get out there and do more for my community to make a difference however I am able. Oral Parity is an issue we learned about in DC through OCRA training, and it struck a chord with me. Some insurance companies are able to cover chemo pills differently than IV chemo, leaving patients with impossible to pay monthly bills. Luckily we have good insurance through my husband’s work, so even though each surgery I had was over $40,000, we only pay a cap of $8,000 every year. What if I didn’t have good insurance? If this happened to me a few years ago, I’d be struggling because my insurance plan wasn’t as strong. People wind up bankrupt and still don’t get the care they need. Maintenance is required for ovarian cancer. We have doctor’s appointments every three months. You need money to have this disease, and that is unfair. Hopefully the work we have been doing in DC will change that soon! What would you tell somebody who is thinking about becoming an OCRA Advocate Leader? There is so much to learn from OCRA. There are endless amounts of things I can do as an advocate that I haven’t even tapped into yet. I encourage everyone to get involved. Even if you can’t travel, or if you’re shy, or if you’re a private person who isn’t comfortable sharing your story, you can get involved in other ways. Email your representatives, become part of a phone tree. There are many tiers for getting involved. It’s not an all-or-nothing thing. I started sharing more after becoming an advocate. If even one person hears my story, recognizes symptoms, sees their doctor, and gets diagnosed early, I’ll be successful. I don’t know how long I have, and I want to do something meaningful with my life. I want to spend the time I have making a difference, and the OCRA Advocacy Program encourages me to do that. If you feel like you want to take back some control in your life, and make a difference in the lives of others, becoming an Advocate Leader will give you all that and more!